Dec. 2, 2001 - Changed the Culp family page. Added photos of Christopher and Frances Culp's tombstones. Added information on Johann Christian Kolb. Apr. 24, 2001 - Added Earl Tripp's letters home from the Army. Feb. 10, 2001 - Added Mayflower ancestors on the Tobey page. Feb. 8, 2001 - Updated database of names. Added descendants of Thomas Tobey. Feb. 5, 2001 - Updated database of names. Added Eugene Durkee's obituary. Added Milo Tripp's will. Feb. 4, 2001 - Corrected labels on "Old Durkee & Tripp Photo Album". Feb. 2, 2001 - Added Eugene Durkee's teaching certificate and letters he wrote. Added letters explaining Earl Tripp's death. Added Lydia Jane Mulnoux obituary. Jan. 12, 2001 - Added John Pincomb's obituary received from William Wallace Pincumbe. Changed and cleaned up web pages and links. Updated Colby page. Added "Timetable of American History". Added Burrell page. Jan. 11, 2001 - Completed move to "www.Pincumbe.com". Moved Brady photographs to the "photos" directory. Jan. 10, 2001 - Started moving page to "www.Pincumbe.com". Jan. 7, 2001 - Created Culp page, added Burton Collection photographs, and added Brady photos from Floyd and Alice Brady's album. Jan. 5, 2001 - Created pages for Durkee, Steele, Tobey and Tripp. Nov. 15, 2000 - Redesigned page. Put Maps and Links on separate pages. Nov. 2, 2000 - Added a ancestor chart for Deborah Tobey and updated the database of names. Oct. 28, 2000 - Updated database of names. Oct. 23, 2000 - Created page for Colby family. Oct. 23, 2000 - John and Thomas Barton are brothers. I had Thomas as Mary (Barton) Burrell's father, it should be John. So I changed Thomas and Elizabeth (Alban) Barton to John and Jane (Thompson) Barton. 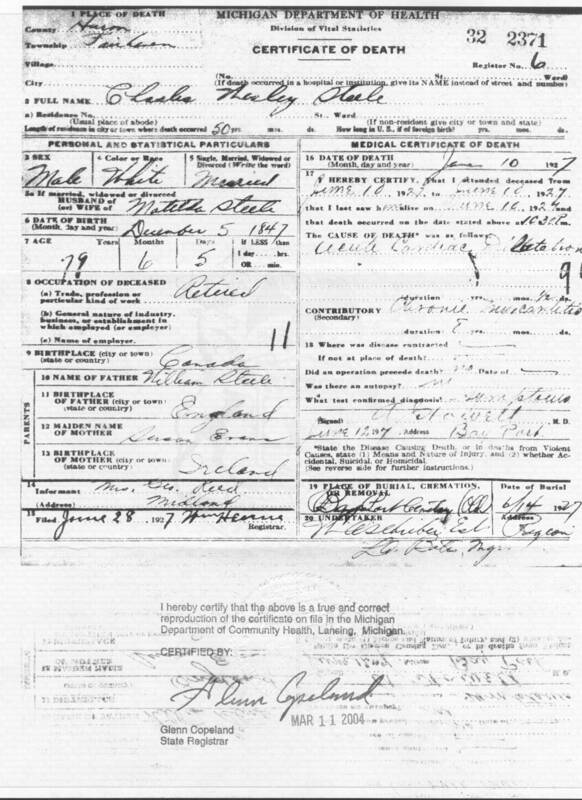 Thomas and John's parents are John and Massie (Wade) Barton. Oct. 22, 2000 - Created page for Huntley family of Howell, Livingston County, Michigan. Sept. 11, 2000 - I updated Eugene and Tirzah Brady's family. They had 14 children and this is my latest attempt at getting them correct. I also redesigned the Brady pages. Aug. 31, 2000 - A new "Brady Ancestor Chart" is online. The new chart has William and Hulduh Huntley and Elizabeth Barton. George H. Brady was added to the Brady page. He is a child of Eugene and Tirzah Brady. Corrected ADelbert Brady's birth day (b:17 Mar 1879). Apr. 19, 2000 - The photo page is online. It contains old Durkee & Tripp family photographs. The album belonged to Edith (Durkee) Tripp, then Viletta (Tripp) Pincumbe. Apr. 10, 2000 - Created page for Brady. It has information on George Brady, one of the early settlers and founders of Mecosta County, Michigan. Apr. 8, 2000 - Created page for Pincumbe. It contains information and photographs of Henry and Catherine Pincumbe of Huron County, Michigan.